People sometimes find themselves wishing they volunteered more and, in fact, the U.S. Government cited it as one of many consistently popular New Year’s resolutions, right up there with losing weight and getting better jobs. The benefits seem to tie back to ideas of an improved sense of well-being and giving back to the community. Yet, just as often, work, family and other commitments prevent people from getting involved. Businesses may already want to consider allowing their employees time and resources to volunteer, partly as a means of encouraging employees to meet their own personal goals, but also as a way of fostering bonding throughout their staff and getting their companies active and visible in the local community. Yet, even if organizations can’t offer volunteering opportunities to their own employees, they should at least think about encouraging volunteering in the next generation. The benefits not only extend to improved health and well-being of a community but also potentially in the lives of the youth. With National Youth Leadership Month in February, promotional items may be the key to encouraging volunteer work. The Corporation for National and Community Service cites numerous benefits that come with volunteering. Among them are fostering personal growth, developing bonds, building communities, solving problems and improving lives. All of these tenets are worthwhile reasons to lend a hand, but scientific studies have also suggested that there are health benefits to be associated with volunteering. According to observational evidence summarized in a study by the University of Exeter Medical School, there may be a 20 percent reduction in mortality among volunteers compared to non-volunteers. The NCS has also pointed to lower mortality rates for volunteers after taking into account physical health, age, gender and financial status and other variable factors in a report about the health benefits of volunteering. Other advantages include greater life satisfaction, lower rates of depression and improved health. The report also noted that volunteer rates have a positive correlation with a state’s physical health. Encouraging volunteering through promotional giveaways could be a way for businesses to contribute to their own community’s health. One of the most interesting aspects of the report were findings that suggested a cycle of positive reinforcement between volunteering and physical well-being. The more people volunteer, studies suggested, the more they experienced boosts in happiness, satisfaction, self-esteem and a sense of control, and so the more likely they were to volunteer. Organizations have the opportunity to start that cycle, or at least encourage it. Also according to the NCS, an estimated 55 percent of American youth between the ages of 12 to 18 volunteer, totaling more than 1.3 billion hours of community service annually. Students who volunteered also reported doing better academically than their peers, according to the report. The momentum for student volunteering already exists – companies need only continue encouraging future generations. 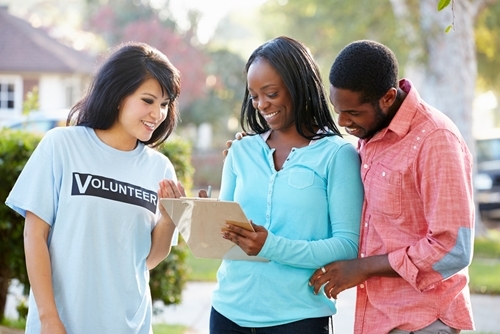 Companies can start to motivate volunteers simply by giving away promo items in conjunction with advertising organizations’ preferred non-profits and charities. These goods may be given in-store or serve as a part of a larger marketing campaign that utilizes social media. Businesses can announce via Twitter, Facebook or Instagram that customers who arrive at certain locations can receive free giveaways as well as registration forms for volunteering with certain organizations via Twitter, Facebook or Instagram. Companies that want to interact with their customers more meaningfully can host their own volunteer events, whether it’s providing assistance at a homeless shelter, cleaning up a park or collecting donated canned goods. Businesses should give thought to the kinds of volunteerism they favor and that children may also find appealing. They may also want to reward children who put in a significant number of hours with executive gifts to thank them for their hard work.